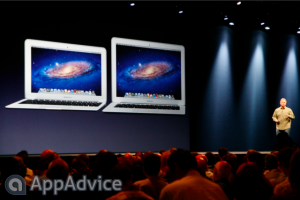 For the first time since 2009, Apple announced new Mac updates at today’s Worldwide Developers conference in San Francisco. These are no minor updates, either. The company has refreshed its entire line up of MacBook Airs and MacBook Pros with Ivy Bridge processors, and they're all on sale today! There's also an all new MacBook Pro you won't want to miss. MacBook Air Apple’s 11-inch and 13-inch MacBook Airs received a refresh, but unfortunately, the new ultra thin laptops will not include the much coveted Retina display. That’s not to say they won’t be given a Retina display in an update later this year, but for now, the Airs are stuck with a standard screen. 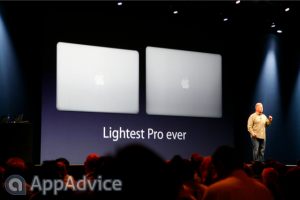 The new entry level Airs will feature 1600 GHz 4GB of RAM, while the upgraded version comes equipped with 8GB of RAM. Solid state hard drives in the 11-inch will range from 64GB to 256GB, while the drives in the 13-inch start at 128GB and go up to 512GB. The drives will have a 500MBps read speed, two times faster than before. According to the keynote, the new MacBook Airs will be significantly faster, with up to 2Ghz core i7 processors, USB 3.0, and 60% faster graphics. The camera will be improved to 720p, and prices will start at just $999. MacBook Pro Apple's MacBook Pros now come with quad-core i7 Ivy Bridge chips up to 2.7GHz, that turbo boost to 3.7Ghz, up to 8GB of 1600GHz RAM, and a Kepler GeForce GT 650M with up to a gigabyte of memory, along with USB 3.0. 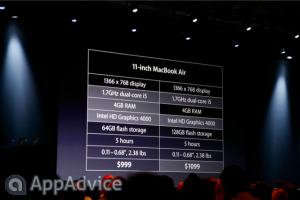 The 13-inch starts at just $1199, up to $1499 with upgrades. 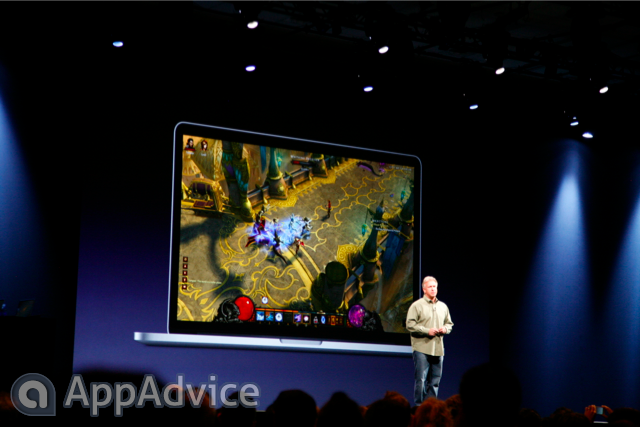 The 15-inch starts at $1799, up to $2199 with upgrades. In addition to the traditional MacBook Pros, Apple also announced the next generation MacBook Pro, which, as expected, comes with a gorgeous Retina display along with a redesign of the casing. It's slimmer, far more powerful, and forgoes an optical drive. The new MacBook Pro is not tapered like the MacBook Air, but it's still radically thinner, at just 0.71 inches, which is 1/4 thinner than the current MacBook Pro. At just 4.46 pounds, it's the lightest MacBook Pro ever, and its Retina display sports a pixel density of 2800 x 1800, or 220 ppi. That display also comes with less glare, better viewing angles, and higher contrast ratios. 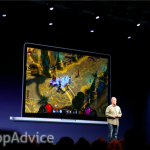 Like the regular MacBook Pros, the new MacBook Pro comes equipped with up to a 2.7GHz quad-core i7 Ivy Bridge processor and up to 16GB of RAM, with a Kepler GeForce GT 650M graphics card. It also has a 768GB solid state drive, and amazingly enough, even with a Retina display, this new MBP is getting seven hours of battery life. Wow! The right side of the MacBook Pro will have SD, HDMI, and USB 3.0, while the left has MagSafe 2 (an all new, thinner MagSafe plug), Thunderbolt, another USB 3.0 slot, and a headphone jack. There are FireWire 800 and Gigabit Ethernet Thunderbolt Adapters, plus a Black Magic 5k camera that can connect over Thunderbolt. There's also a glass trackpad, 801.11n Wi-Fi, Bluetooth 4.0, FaceTime HD, stereo speakers, and dual microphones. 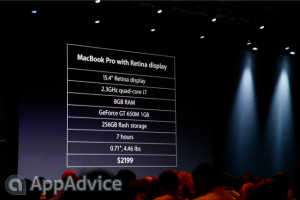 Prices start at $2199 with a 2.3 GHz processor, 8GB of RAM, and 256 GB of flash storage. This is, by far, Apple's most advanced notebook, and it starts shipping today!